Stroudsburg, PA (Exit 305 off Interstate Rt. 80) near downtown. 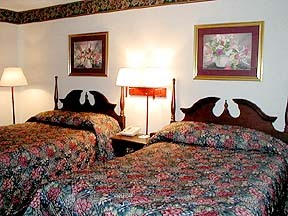 General Hotel Information: A full-service, 2 story, 134 luxury-room hotel with a PoconosHotels 3 star rating conveniently located near all major attractions in the Poconos. Features nonsmoking rooms, disabled facilities, fitmess center, an indoor tropical courtyard, heated indoor pool, saunas & Jacuzzi rooms. Corporate rates offered; 4 meeting facilities with 300 person capacity, and wedding/banquet accommodations with 150 person capacity available. Nearby Area Attractions include Camelback Ski Area and Camelbeach Water Park; Shawnee Mountain Ski Area and children's Water Park & activities program (under 12); Crossings Outlets - Over 100 name-brand stores offering large discounts on clothing, china, jewelry and many other quality items. Bushkill Falls - An outstanding series of 7 waterfalls, called the "Niagara Falls of Pennsylvania," along with a Native American exhibit, miniature golf, boating, gift shop, picnic area, fudge kitchen, snack bar and free parking. White Water Rafting and Canoeing - A choice of a calm canoe ride or thrilling whitewater on a raft along the scenic Delaware's famous rapids, spectacular cliffs, wild flowers and crystal clear water. Over 30 area Golf Courses to fit all different skill levels. Served by Scranton, Lehigh Valley, and Newark Airports. 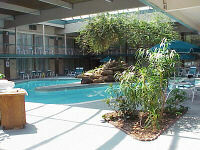 All major Pocono Attractions only minutes from the hotel. Just 75 minutes from New York and 2 hours from Philadelphia. Hotel Information Surrounding Area Areas served are Poconos, New Jersey, New York, Pennsylvania Airports: Newark Airport (75 miles); JFK International Airport (90 miles); Scranton Airport (50 miles)Lehigh Valley (40 miles).